Out’n About! 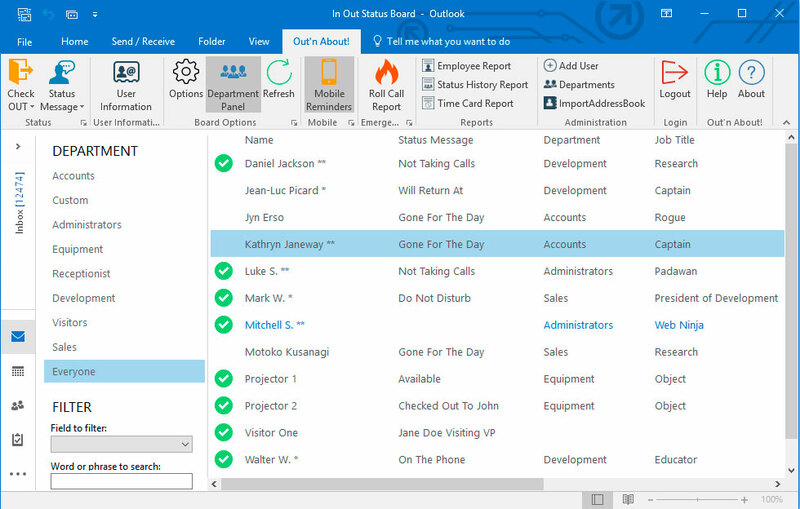 for Outlook replaces your old fashioned in/out status board, and makes it easy to manage your workforce's current availability and timesheets. Office 365 compatible. No need for a separate system to track your employee’s work hours. Use your existing Outlook environment, and your employees can easily track their work hours. Quickly and easily see your employee’s current availability, with no need for a separate program running in the background. You’ll enjoy Out’n About! for Outlook’s modern looks, and ease of use. Easily place your workforce into custom department names, control what information is seen on the status board. Run custom reports to match your business needs. Out’n About! for Outlook is BUILT for Administrative Assistants and Managers. Track the whereabouts of your employees in real time, from your phone or desk with an electronic in/out board from Out’n About! Fully integrates with all versions of Outlook and Windows for a user-friendly experience that you’ll love to use. Update your status and view the board over email. Easily schedule your future status events. Try before you buy, no obligation. Never forget to check in when you’re back. Over 500,000 users worldwide. Here are some of our most famous customers. *We’re totally guessing, but that sounds about right.